What do the read profiles of small non-coding RNAs represent? How to cluster the read profiles based on some intrinsic features? Small Non-coding RNAs (ncRNAs) play a vital role in many cellular processes such as RNA splicing, translation, gene regulation. The small RNA-seq is a type of RNA-seq in which RNA fragments are size selected to capture only short RNAs. One of the most common applications of the small RNA-seq is discovering novel small ncRNAs. Mapping the small RNA-seq data reveals interesting patterns that represent the traces of the small RNA processing. For example, consider the miRNA biogenesis. The primary miRNA transcripts are processed by Drosha-complexes and results in hairpin precursor miRNAs. Then after they transported to the cytoplasm, Dicer slices off the hairpin. One of the RNA strands bound by Argonaute proteins regulates the target mRNA while the other strand is degraded. The following figure (bottom part of the figure is taken from DOI: 10.1038/nrg3162) represents one of the small RNA processing patterns. The vertical block bars represent a mapped reads on reference genome. The height of the bars represents the number of reads mapped at that location. Reads in each bubble represent a read profile. In this case, they both are from miRNAs. From the small RNA-seq, we often see the two processed miRNA strands after mapping. The miRNA strand which targets the mRNA is expressed and we see more reads compared to the degraded strand. The gap between those two piles of reads represents the missing hairpin. In this tutorial, we will learn how to use BlockClust to cluster similar processing patterns together. The data is we use is from human cell line MCF-7 sequenced in single-end on Illumina Genome Analyzer II. Reads are 36nt long and should be sufficiently long enough for this type of data. We start with a BAM file as an input for this tutorial. This BAM file is a result of mapping the reads on human reference genome build hg19 using segemehl. If you want to use your own raw sequencing data, please clip the adapters and map to the reference genome. In the first step, we convert the BAM file into BED file. This is not a plain file conversion. Hence we cannot use any kind of BAM to BED conversion tools. We use BlockClust tool in the pre-processing mode for this purpose. The resulting BED file contains tags (a tag is a unique read sequence in a deep-sequencing library) and their normalized expression (in column 5), i.e. the ratio of the read count per tag to the number of mappings on the reference genome. Why is it mandatory to clip the adapters from the small RNA-seq data? Generally, the processed RNA fragments from the small RNAs are about 18-30nt long. If the sequenced read length is longer than the fragment (which is usually the case), the sequencer reads into the 3’ adapter. Before continue to BAM to BED conversion we need to sort the alignments in the input BAM file by their positions. Now it is time to do the actual conversion. Now we group the adjacent reads into so-called blocks and blockgroups using blockbuster tool. 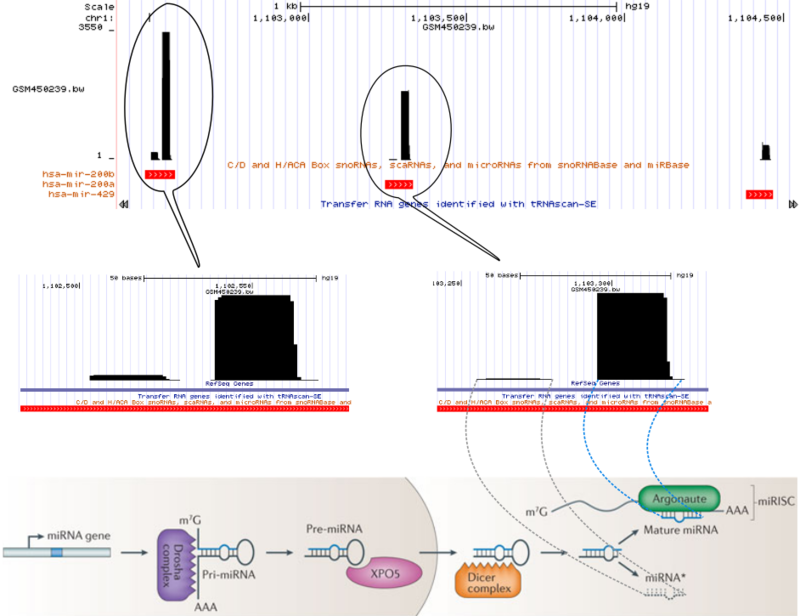 In general, each blockgroup should represent a single ncRNA read profile. In order to run the blockbuster successfully the input BED file need to be sorted by chromosome, strand, start position and then end positions. Here we use BlockClust in clustering mode. All you need here is the output of the blockbuster. Apart from clustering, BlockClust has built-in class specific discriminative models for C/D box snoRNA, H/ACA box snoRNA, miRNA, rRNA, snRNA, tRNA and Y_RNA. So it can also be used to predict if a read profile might belong to one of the known ncRNA class. The tool produces the following four output files. The BlockClust: BED of predicted clusters file is the result of Markov cluster algorithm. Each entry in this file represents a blockgroup. The 4th column contains is in the form of annotation:blockgroup_id:cluster_id. The cluster_id represents which cluster the blockgroup belongs to. The BlockClust: Model based predictions BED file is the result of classification. Each entry in this file represents a blockgroup. The 4th column contains the annotation of the ncRNA which it overlaps. For the blockgroups which are not overlapped with any known ncRNAs, the prefix predicted_ is added indicating that it is predicted by the BlockClust classification models. The BlockClust: Hierarchical clustering plot file shows a dendrogram construced based on average linkage clustering. The BlockClust: Pairwise similarities file contains the pairwise similarities of all input blockgroups. Next, we will visualize the read profiles (from the BAM file) and the predictions (BED from BlockClust) together. Go to the location chr4:90653059-90653141 in IGV. Do you see any already annotated transcript in that location? What does the read profile resemble? There is no annotated gene from RefSeq annotation on the same strand. It resembles the miRNA profiles mentioned in the introduction section. One of the read piles looks like mature miRNA and the other like miRNA*. In this tutorial, we learned how to use BlockClust to cluster real small RNA sequencing read profiles based on their similarity. We also learned that the BlockClust can also be used to classify the read profiles based on pre-built classification models. This material is the result of a collaborative work. Thanks to the Galaxy Training Network and all the contributors ( Pavankumar Videm)!